Michael Ilitch, Sr. (born July 20, 1929) is an American entrepreneur, founder and owner of the international fast food franchise Little Caesars Pizza. He owns the Detroit Red Wings of the National Hockey League and Detroit Tigers of Major League Baseball. A graduate of Cooley High School in Detroit, Michigan, Ilitch entered the U.S. Marine Corps for four years. After his return home to Detroit, the Detroit Tigers offered him $3000 if he would sign to play baseball, and Ilitch had a four-year minor league career from 1952 to 1955. Ilitch played mostly second base for the Tigers', New York Yankees', and Washington Senators' organizations in the Pennsylvania–Ontario–New York League, Cotton States League, and Florida International League. He was forced out of his playing career due to a knee injury. As of 2012, the family's entities remain privately held. In 1999, the Ilitches established Ilitch Holdings, Inc. to provide their various enterprises with professional and technical services. They hold the titles of chairman and vice chairwoman, respectively. The combined total revenues for these enterprises in 2007 reportedly exceeded $1.8 billion. Ilitch had fallen off Forbes magazine's annual list of the "400 Richest Americans," but in 2006 he returned to the list at #242. As of 2010 he rose to #238 with an estimated net worth of $1.7 billion. Marian Ilitch in 1998 reportedly divested herself of any personal interest in the Detroit Tigers organization to pursue interests in Detroit's emerging casino gambling industry. She acquired a significant interest in the Motor City Casino and, in 2005, purchased sole controlling interest. She independently pursues other gambling interests, doing business as Gateway Casino Resorts, LLC and Barwest, LLC, among other names. The pair have seven children. In 2000 they appointed two of their children as co-presidents of Ilitch Holdings, Inc. in 2000: Christopher Ilitch and daughter Denise Ilitch, an attorney. Christopher Ilitch was named to the new post of CEO and president. Denise Ilitch has left the privately held company "to pursue other opportunities". The Detroit Caesars were a professional softball team that began play in the American Professional Slow Pitch Softball League (APSPL) in 1977, the first of three professional softball leagues. Prior to formalized professional play, Detroit was a hotbed for softball, with some of the best players in the country playing in the most competitive amateur leagues to be found in the US. A major sponsor of softball in the Detroit area was Little Caesar's, and with the formation of a professional league, Ilitch formed a team in his first step into professional sports ownership. The Caesars played at Memorial Field in East Detroit, a small suburb of Detroit that had recently played host to a national softball tournament. With clever promotions tied in with the pizza chain and the signing of former Detroit Tiger stars Jim Northrup and Norm Cash, fans packed into the small stands by the thousands to witness not only Detroit's best softball players, but those that Ilitch had brought to town to make his team into the powerhouse of professional softball. Mike Nye, Ronnie Ford, Bert Smith, Tex Collins and many other softball legends took to the field for Detroit, led by manager Gary Vitto, earning the team two World Series titles before disbanding after the 1979 season. In 1982, Ilitch bought the Detroit Red Wings from Bruce Norris for $8 million USD, and has turned the team into a perennial contender for the Stanley Cup. After years of drafting top picks and grooming their young players, and with proper management and leadership, the Red Wings have become an elite NHL team. They made the Stanley Cup finals three times between the 1994–95 and 1997–98 seasons, winning the Cup in 1997 (fifteen years after Ilitch purchased the Red Wings) and again in 1998. The Red Wings added two more championships in 2002 and 2008. Prior to the 2004–05 NHL lockout, Forbes magazine ranked the Red Wings as the fifth-most valuable franchise in the NHL, despite a $16 million operating loss. For the 2007–08 hockey season, the team won the President's Trophy for the best record in the NHL for the sixth time—the most of any NHL team since the President's Trophy was introduced in 1985–86. The Red Wings have made the playoffs for 25 consecutive seasons through 2015–16. The 25 consecutive playoff berths is the longest active streak of post-season appearances in all of North American professional sports. It is tied for third all-time in NHL history after 29 consecutive appearances by the Boston Bruins from 1967–68 to 1995–96, 28 consecutive trips by the Chicago Blackhawks from 1969–70 through 1996–97, and is tied with the 25 consecutive appearances by the St. Louis Blues from 1979–80 to 2003–04. Ilitch purchased the Detroit Tigers in 1992 from fellow pizza magnate Tom Monaghan—the founder of Domino's Pizza—for baseball was a sport that he had played as a youth. Under his ownership, the Tigers logged losing records in twelve out of thirteen seasons before their turnaround in 2006. 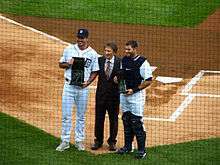 In 2005, the Detroit Tigers hosted MLB's 76th All-Star Game at Comerica Park. All-Star Week in Detroit produced the highest-grossing revenue in the history of the All-Star Game. Forbes magazine ranked the Tigers #22 in its 2005 list of the Top 30 most valuable sports franchises. When the Tigers won the AL Wild Card under manager Jim Leyland and general manager Dave Dombrowski in 2006, they made the playoffs for the first time since 1987. Detroit eventually lost in five games to the St. Louis Cardinals in the World Series. Since Dombrowski was brought in, Ilitch has steadily agreed to bring in marquee free agents and finance a larger payroll, with the Tigers beginning the 2008 season as one of the highest-salaried teams in baseball. On September 16, 2011, the Tigers won the Central division title—their first division crown since Ilitch's purchase. On January 24, 2012, Ilitch signed Prince Fielder to a nine-year, $214 million contract, the fourth-largest contract in baseball history. The 2012 Tigers went all the way to the World Series, but were swept by the San Francisco Giants. Prior to the 2013 season, Ilitch agreed to sign starting pitcher Justin Verlander to a seven-year, $180 million contract extension, at the time the highest single offer ever tendered to a major league pitcher. Ilitch was one of the early team owners in the Arena Football League, starting up the Detroit Drive in 1988, somewhat as a filler team for summer dates in the Joe Louis Arena, although Little Caesars was also one of the major sponsors of the AFL during the time Ilitch owned the Drive. The Drive were one of the most successful teams in the early days of the AFL, both on and off the field. They generally had strong attendance (although much of that was due to discounted or giveaway tickets), and the Drive were in the ArenaBowl in every year of their six-year existence, going 4-2 in the title games. After Ilitch bought the Tigers in 1992 though, he decided he didn't want to own another franchise that would take away fans from the Tigers, so he sold the team off and they moved to Worcester, Massachusetts. Ilitch was inducted into the Hockey Hall of Fame in 2003 as well as the United States Hockey Hall of Fame in 2004. In Stanley Cup history, only 12 women have had their names engraved on the trophy; these include Ilitch's wife, Marian, and their three daughters. One of Ilitch's first philanthropic efforts was the Little Caesars Love Kitchen, established in 1985. The traveling restaurant was formed to feed the hungry and assist with food provisions during national disasters – most recently helping the flood victims and volunteers in North Dakota. The program has been recognized by former Presidents Bill Clinton, George H. W. Bush and Ronald Reagan, and has served more than 2 million individuals in the United States and Canada. In 2006, inspired by a veteran returning to civilian life after losing both of his legs in war, Ilitch founded the Little Caesars Veterans Program to provide honorably discharged veterans with a business opportunity when they transition from service or seek a career change. Ilitch received the Secretary's Award from the U.S. Department of Veterans affairs for this program in 2007; it is the highest honor given to a civilian by the department. Today there are 50 Little Caesars Veteran franchisees who have applied more than $1.5 million in benefits. The Little Caesars Amateur Hockey Program, established by Ilitch in 1968, has provided opportunities for tens of thousands of youngsters over the years. Not only has it paved the way for a number of extremely talented players to make it to the NHL, it has helped develop character on and off the ice for those who have participated in the program. Additionally, Ilitch Charities for Children was founded in 2000 as a non-profit foundation dedicated to improving the lives of children in the areas of health, education and recreation. In 2008, the charity was renamed Ilitch Charities and its focus was broadened. The new charity invests in the community's future by supporting innovative, collaborative and measurable programs that promote economic development and spur job growth, as a means to address social issues such as poverty, unemployment, homelessness, and hunger. As a result of his philanthropy, the School of Business for Wayne State University in Detroit is named the "Mike Ilitch School of Business". According to the Center for Responsive Politics, reports required by the Federal Election Commission from 2002 to 2005 indicate Ilitch Holdings, Inc. members and business partners have contributed more than $500,000 to political campaigns and PACs. Mike and Marian Ilitch have seven children: Christopher Ilitch (born June 1965) is CEO and president of Ilitch Holdings, Inc.; daughter Denise Ilitch (born November 1955) is an attorney. Other children are Ron (born June 1957); Michael, Jr.; Lisa Ilitch Murray; Atanas; and Carole (Ilitch) Trepeck. Each of the 7 children has his or her name engraved on the Stanley Cup of 1997, 1998, 2002, and 2008, since they each own shares in the Detroit Red Wings. The family was presented the key to the City of Detroit by Mayor Kwame Kilpatrick on February 14, 2008. They are the fifth recipients of this award in the history of the city. ↑ "Michael & Marian Ilitch & family". Forbes. Retrieved 17 November 2016. ↑ "The Ilitch Family | Little Caesars Pizza". Littlecaesars.com. 2000-04-11. Retrieved 2015-09-30. ↑ "Live Work play : A Report to the Community : Ilitch Companies" (PDF). Ilitchcomapnies.com. Retrieved 2015-09-30. ↑ "Thrilled by Wings, Mike Ilitch hopes to help pennant push next | Detroit Free Press". freep.com. Retrieved 2015-09-30. ↑ "NewsLibrary.com – newspaper archive, clipping service – newspapers and other news sources". Nl.newsbank.com. Retrieved 2015-09-30. ↑ "The Most Trusted Place for Answering Life's Questions". Answers. Retrieved 2015-09-30. ↑ "2002 MPO Convention Keynote Address : Chris Ilitch Touches Macedonian Hearts" (PDF). Macedonian.org. Retrieved 2015-09-30. ↑ "On one One with Mike Ilitch". LegendsofHockey.net. Archived from the original on 2007-09-29. Retrieved 2007-07-16. ↑ "Michael Ilitch Minor Leagues Statistics & History". Baseball-Reference.com. Retrieved 2015-09-30. ↑ Archived November 1, 2006, at the Wayback Machine. ↑ "#242 Michael Ilitch". Forbes.com. 2006-09-19. Retrieved 2015-09-30. ↑ Archived September 14, 2007, at the Wayback Machine. ↑ "Justin Verlander of Detroit Tigers agrees to deal which could be worth $202 million, sources – ESPN". Espn.go.com. 2013-03-29. Retrieved 2013-03-30. ↑ Aguilar, Louis (2015-10-28). "Ilitches to build Wayne State a new business school". The Detroit News. Retrieved 2015-11-16. ↑ Archived February 24, 2012, at the Wayback Machine. ↑ "Michigan news | Detroit Free Press". freep.com. 2008-02-15. Retrieved 2015-09-30. ↑ "Page D-1 | The Michigan Chronicle". Michronicleonline.com. 2014-01-15. Retrieved 2015-09-30. Official Site: Ilitch Holdings, Inc.